Every women responds to various depression treatments in a different way. Finding the right therapy is often a trial-and-error journey, but luckily, modern psychology and psychiatry offer several types of psychotherapy that can bring relief to women suffering from depression. They often find that the most optimal form of therapy combines a few different approaches. The most common types of depression therapy include. It teaches women to observe their negative and destructive thought patterns and actions and then replace them with the positive and constructive ones. It is helpful in dispersing the distorted perceptions and interpretations of various situations and gain a more grounded and realistic view. It is designed for women with chronic or recurring depression, and it combines the cognitive-behavioral techniques with mindfulness principles, such as meditation. It usually lasts for eight weeks, and has been beneficial in reducing depression symptoms, decreasing stress, and restoring emotional balance. Some women struggle with some unresolved issues from their early-life, often unconsciously, which can lead to long-term and recurring depression. This type of therapy helps to identify these repeating patterns and resolve them, so they no longer trigger the flare ups of depression. It can be short-term and focus on a specific issue, or it can take a few years to bring relief. It helps locate conflicts in women's relationships with family, friends, and other people in their circles and teaches them the ways to resolve them through better communication skills and openness. It typically takes three to four months to experience its benefits. In the recent years, online therapies have become popular. They involve having video sessions with a certified mental health professional, using one of the common video-calling programs, such as Skype. This option is especially helpful for those women who could not otherwise commute to their therapist's office, because of the distance, schedule conflict, or because their depression is so severe that it disables them from leaving their home. Finding a therapist locally is generally easy, too. Many of them advertise on the internet, and their websites can be found in any search engine. Also, numerous organizations that focus on raising community awareness about depression and other mental health issues are a good place to start. They either have their own specialists on staff or can provide a list of verified therapists in a given region. How to Choose a Good Therapist? Various therapists might have different approaches to depression, so before searching for one, it would be beneficial to clarify what your expectations are. Read the tutorials written by the previous patients, ask your friends for recommendations, and do not hesitate to request an appointment to meet your therapist prior to starting therapy. The goal is to feel safe and open in their presence. It is also important to check the therapist's credentials. 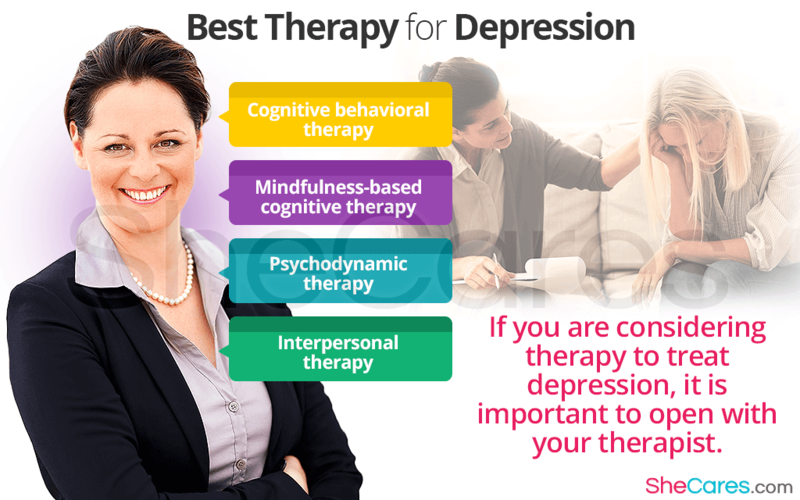 Most therapies are done by licensed psychiatrists, who are medical doctors specializing in mental disorders and psychologists, preferably with a PhD in psychology, but other mental health professionals, such as social workers, psychiatric registered nurses, and licensed counselors can also be trained to provide therapy. Depression prevents women from seeing the situations they are facing in their real form. They see them in dark colors, as too overwhelming and complicated to handle. The goal of psychotherapy is to show women that every situation has a solution and giving them tools to overcome their depression. In some cases, psychotherapy is the most effective when it is combined with medication. Ask your doctor to customize the treatment to fit your individual needs.